47. … the glorious Almighty Lord [Krishna] ascended his divine chariot along with Arjuna and sped towards the west. 48. Then passing over the seven island-continents and the seven oceans dividing those continents, the seven mountain ranges and the Lokaloka mountain, which divides the visible world from the region of darkness, he entered the region of darkness. 49. … In that pitch-black darkness, his horses, Saibya, Sugriva, Meghapushpa and Balahaka lost their way and could not proceed. 50. 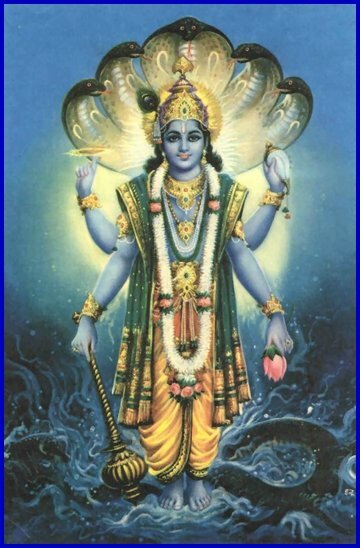 Noticing their plight, Lord Krishna, the Master of all experts on Yoga, discharged ahead his discus Sudarshana, which was effulgent like 1000 suns shining simultaneously. 51. Piercing through that extremely horrendous, palpably thick all-pervading darkness, the effect of Prakriti or created by the Lord himself with its exceedingly enormous lustre, the Sudarshana discus with the speed of the mind (quick like thought or imagination) cut its way like the arrow of Rama discharged from the bowstring penetrated through hostile army. 52. Following the path cut by the discus, the chariot reached the end of darkness. Arjuna saw that Supreme, Infinite, dazzling lustre beyond that dark region (of Prakriti). But his eyes became dazed and he closed his eyes. 53. Thereafter he entered water (the ocean) adorned with huge billows lashed up by powerful tempestuous gales. Verily he saw then a wonderful mansion highly resplendent with thousands of columns of brilliant jewels. 54. And in the mansion, he beheld the presence of the Serpent Sesa (Ananta) who was the most formidable yet wonderful to look at. He was radiant with brilliant jewels on each of his 1000 hoods, with two fierce eyes. His body was white like the Himalayas but was black at the neck and in the tongue. 55. He [Arjuna] beheld the all-pervading Lord of infinite powers [Vishnu] resting on the soft and comfortable coils of serpent Sesa. The complexion of that most exalted Super-human being was dark like a cloud surcharged with water. He wore a yellow garment. He had a cheerful countenance and beautiful longish eyes. 58. Sri Krishna bowed to the Infinite Lord who was himself in another form. Arjuna filled with awe at his sight, paid him obeisance. Both of them stood with folded palms. The Perfect person, the controller of Brahma and other lords (presiding deities) of the spheres, smilingly addressed them in a deep and sonorous voice. 59. … Both of you have incarnated on the earth by your part-manifestations for the protection of righteousness. Having killed the demons who have become a burden to the earth as soon as possible, return to our presence. 60. … for the maintenance of the world, you both have set a model of righteousness for others to follow. 63. Having [thus] visualized the shining region known as Mahakalapura of Vishnu, Arjuna was exceedingly astonished. The Lokaloka Mountain is a ‘mythical’ mountain that encircles the earth and is beyond the seven continents and the encircling sea of fresh water. The sun’s rays do not reach beyond that mountain.